I volunteered for the Crisis Charity serving the homeless for the festive season, back in 2015. I thought it’s important more than ever to share my experiences volunteering. This year who would have thought these unfortunate events (Brexit, Trump, deaths, etc) would have happened. Sometimes, the best present is giving our time for someone. I know it’s corny and naive but it’s true. One thing I learned was compassion is the best gift to give to anyone. I’m not going to delve into the housing or refugee crisis. What’s important is that we help each other, and ease the pain, make them feel at home. Even if it’s for a short amount of time. I wrote this back in December 2015, this is my first-hand and honest experience volunteering for Christmas. There are sensitive topics written here, just to forewarn. “To be honest with you, I haven’t felt festive this year. I missed the ‘Office Christmas Party.’ I was at a different time of my life last year, deciding to go freelance full time after working many years at the gallery. Beginning of this month, my husband Rob was due to work on Christmas day. **(Christmas miracle that he didn’t have to work on Christmas day in the end!) ** Yes, I felt sad about it. I even mentioned I should work from home as well because it wouldn’t be festive cheer without him. I enjoyed organising workshops, after much researching, I decided to volunteer. There was a need for arts and crafts activity leader at the shelter. I thought why not. Applied and got accepted! I was nervous leading up to my first shift but now, I’m pretty excited.‘Guests’ is what we called the homeless persons residing in the centre. We were trained in how to interactive with the guests, what NOT to say, and how to keep ourselves and everyone safe. Also, most importantly – how to engage with the guests. They have been shunned for rest of the year – I never noticed that, and I felt a pang of guilt.You know what, the guests were thankful we were attentive and being so kind to them. A fellow volunteer mentioned you cannot take on the world’s problems. The guests are thankful I and the volunteers are giving up our Christmas to help others. There are lots of volunteers who help and support for the guests to talk about their housing problems, and dentists, doctors on location to look over any health related issues. The hairdressers and salon ladies who volunteered were the busiest bunch, and the guests loved them. They were transformed, after having a beard trim and a clean hair cut. Also, the men LOVE their nails done, they won’t admit but there was a queue to get a manicure. For fun crafty activities, we made a Christmas tree, Christmasy cards, T-Shirt painting and sculpting, many just wanted to paint their imagery alone. The team admired their works of art. I volunteered on Christmas Eve, and it was WONDERFUL. Not to be stressing over Christmas food, not to be doing last-minute shopping, and amongst the bustling frustrated shoppers. We played board games, we had a boogie with choreography, we had Christmas lunch, there was a mini cinema with a selection of movies. I bonded with my team mates and volunteers. 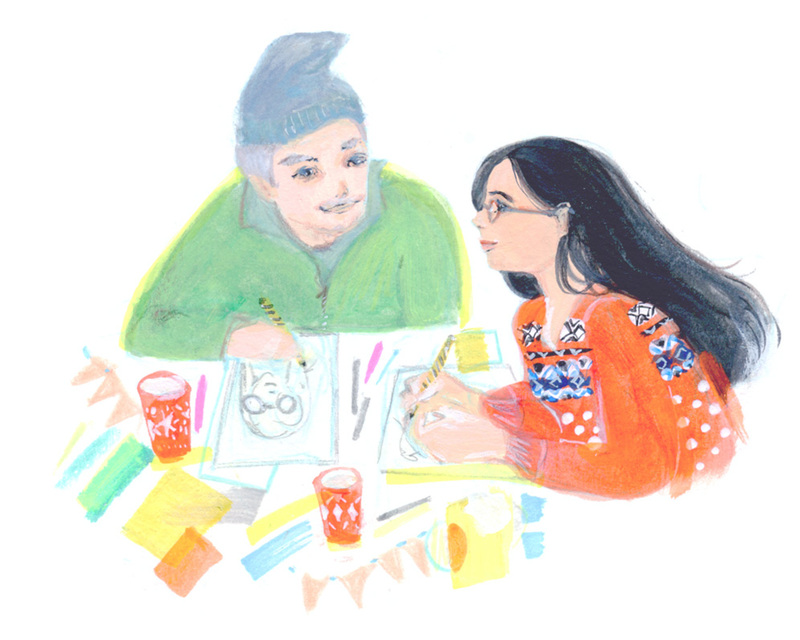 We made posters, designed menus, I drew guests’ portraits and they drew mine. The guests were hesitant on the first days, but they got into the party mood eventually. Many guests were sleeping on the streets for 20 – 30 years, even though we had beds provided – they insisted sleeping on the floor or on a chair. ‘Let them be,’ I thought to myself. ‘They are indoors at least.’I had the opportunity to listen to a guest and his story. He fallen out with his family, lost touch with his son. The guest had major scarring and he told us when he was lit on fire whilst asleep under a bridge. A group of drunken lads poured lighter fluid and kicked him in the stomach. He somehow made it to local A&E, with 3rd-degree burns on his face and left side of his body. I didn’t wish to push him or make him feel obligated to tell the rest of his story. But something he said touched me. He mentioned that volunteers like us, who are giving up their time to make him feel comfortable, makes him believe in mankind. Of course, I drew his portrait! He says I made him look beautiful, I told him he was already. He said he wanted to earn enough money to frame his portrait. When he has a home, he’ll hang it on the wall. There wasn’t many examples of portraits I can show you because I’m not allowed to take photos on-site. We cannot disclose our location or leak sensitive information. Understandably. The frightening thing is that ANYONE can be made homeless. At anytime. A couple I chatted to, was recently made homeless five days before Christmas, due to a dispute with the landlord. Some are educated, some are veterans, some are migrants, majority were English speakers, some were not. Some have crippling debts, some had addiction to drugs, alcohol or gambling, and some have fallen out with their families, kicked out onto the streets. Many guests had jobs. They were in employment, earning money yet no permanent address. I love drawing portraits, and how it made the guests feel. Seeing their confidence grow, and wanting to have a goal to frame their portrait, in their new home. As I left the building, end of my shift, I saw my illustrated portraits leaning delicately alone on the chair. Neatly ‘hanging’ above their sleeping bags and duvet on the floor. There are lots of charities out there who needs people for Christmas, Crisis is one of them who accepted my application. You can volunteer with a friend also! It’s a great and humbling experience looking back on this memory. I totally recommend anyone to do it, even once. You know what, it was a lot of FUN! Thank you always for reading. 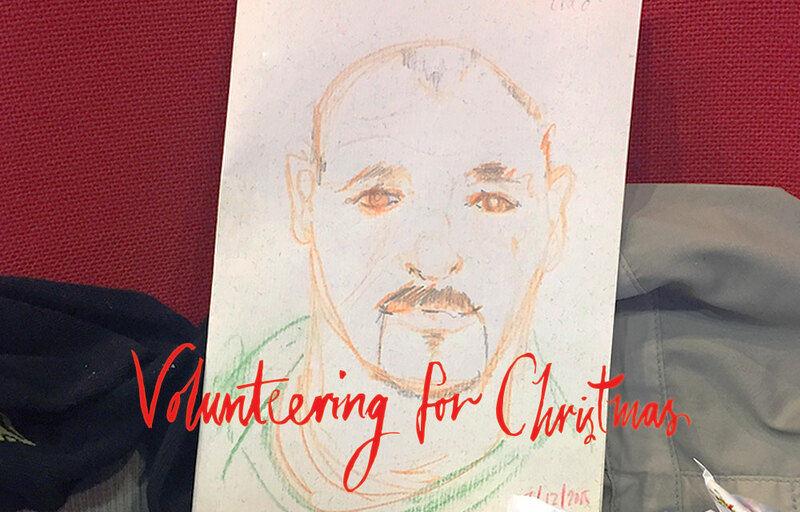 Have you volunteered at Christmas before?